Lynda Ellis (B.A.S. ’81), owner, president and CEO of Capitol Concierge, will be the Forum on Entrepreneurship Breakfast Series keynote speaker Thursday, April 5. Ellis joined Capitol Concierge in 1998 and purchased the company in 2007. Before that, the Nevada native was co-owner of a $25 million instructional technology company. 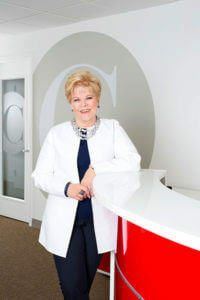 Ellis spent more than 25 years in instructional technology, selling and marketing computer-based education and training products, earning numerous awards for her performance and leadership. She has shared her expertise in publications and is a sought-after speaker, frequently focusing her messages on young women. Founded in 1987, Capitol Concierge was “the nation’s first provider of concierge services for corporate, commercial and residential properties,” according to the company’s website. Capitol Concierge is consistently recognized for their commitment to quality customer service, and it was recently named to the Washington Business Journal’s 2018 Class of Family-owned Businesses. Ellis earned a Bachelor of Applied Science degree in middle management at St. Mary’s University in 1981. While a student at St. Mary’s, she started a customized gift company she later sold for nearly $1 million. At the previous event, in February, the Forum Breakfast series featured James Garvin, Ph.D. – CEO, president and director of CytoBioScience Inc. Past speakers include Daymond John, “Shark Tank” investor and founder of FUBU; Colleen Barrett, president emerita and corporate secretary of Southwest Airlines; Stuart Parker, CEO of USAA; Paula Gold-Williams, CEO of CPS Energy; and Bill Greehey, chairman of NuStar Energy, L.P. The series’ 2017-18 title sponsor is PwC. For information on sponsorship opportunities and purchasing tables and individual tickets, please contact Pamela Luna, CAP-OM, at forumbreakfast@stmarytx.edu or 210-436-3124.